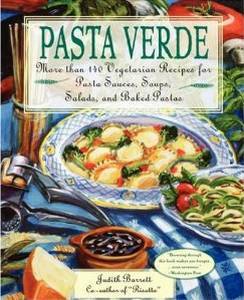 More than 140 Vegetarian Recipes for Pasta Sauces, Soups, Salads, and Baked Pastas. Many people think Italy isn’t keen on vegetarianism - and it’s true that meat and fish play an important part in Italian cookery. But many Italian cook books also emphasise the use of the freshest possible vegetables, and that’s basically what this book does. Its recipes are delicious. It uses not just veggies but spices, herbs and some more unusual ingredients to cook up wonderful Italian pasta recipes, some well known, others not. It has an initial chapter on choosing which pasta for which sauce (always a source of spirited discussion!) and on the choice of olive oils. But there is a “buyer beware” note here. Although this is called a “vegetarian” cook book, it really isn’t. Some recipes use meat stock (so even the author’s use of the word “meatless” isn’t accurate) and some of the cheeses she recommends are animal products. As long as you are aware of this and prepared to substitute vegetarian alternatives this cook book will provide you with many delicious meals. But if you’re a vegetarian who’s likely to be offended by those ingredients appearing in a “vegetarian” cook book, it’s best avoided. to our main pasta recipe books page.